A mixture of animal by products rendered down and dried to a hard jelly like consistency. When heated it takes on a liquid state and can be used as glue. It is the oldest of glues having been used by the ancient Egyptians. The pot actually consists of two pots a larger outer water pot in which water is simmered to warm the inner glue pot that sits on the inside rim of the outer one leaving a gap for a jacket of water around it. This glue is really many different glues from many different animals. It can be from Cow Hides, rabbit skins, fish and hoofs of various animals. Depending on how it was made it can come in crystals as in the photo above or as a stiff jelly. To say that it is as good or better than modern glues would be hard. We have strength tests for glues that can tell us that aspect of the equation, but what about the lifespan. Go into a museum and look at some fine old furniture that may be 300 years old and still in perfect condition and then say that animal glue is useless. 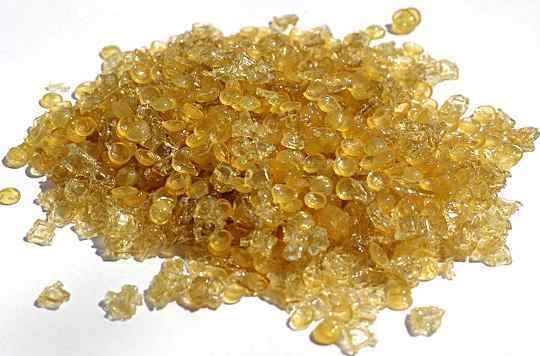 While we now have modern and stronger glues for lots of different applications there is still a small market for animal glue's unique characteristics. Bookbinders use it and of course people involved in the restoration of antique furniture and other old woodwork have to use it. It is still used today for much fine cabinetmaking work using traditional methods. In spite of the materials that it is made out of the glue does not smell unpleasant. It has gap filling capacity and to a certain extent it will hold small glue blocks in position if the air has been rubbed out. It is a natural material that does seem to have an affinity for wood. 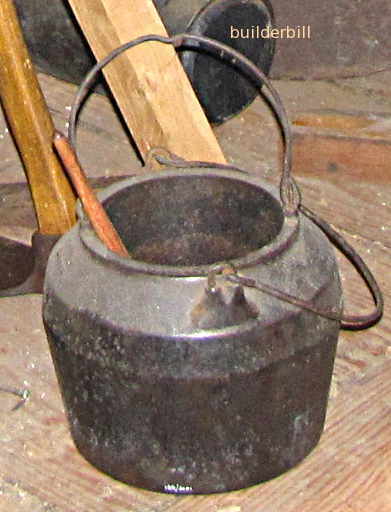 The cast iron pot has of two parts, and outer pot that contains water and an inner pot that holds the glue. This mean that there is a jacket of hot water around the glue pot. The water has to be kept just on the simmer, like cooking a slow stew. Woe betide the first year apprentice in charge of the glue if he lets the pot boil dry. A horrible stink would invade the workshop and in a bad case the glue would be ruined. The choice of material for the pots is no accident. Cooks have long known the advantage of cooking in cast iron, with it's slow heat retaining capacity. The glue is at it's optimum when it is hot and fully liquid, and the cast iron helps to retain the heat when the inner pot is carried to a bench for gluing up.